Jurgen Klopp committed a managerial faux pas in the aftermath of Chelsea vs Liverpool yesterday as he celebrated wildly with the staff in the Liverpool dugout. According to the Mirror, he was so keen to get onto the pitch and celebrate with his players that he totally forgot to shake hands with opposite number, Antonio Conte. Luckily, Conte was jovial about the situation, laughing to himself as he walked off down the tunnel. 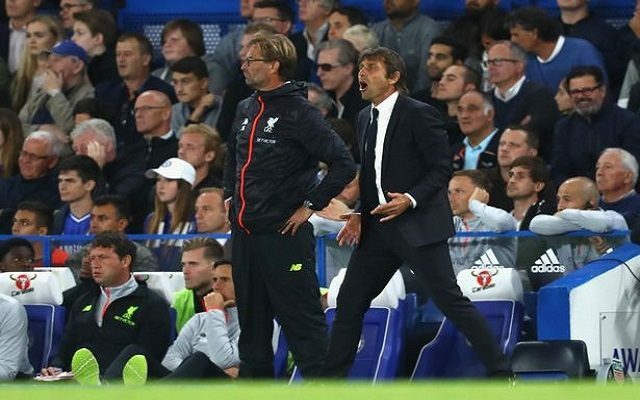 We’re sure there are no hard feelings – there was a bit of a pre-match love-in between the two as Klopp called Conte the ‘Guardiola of Juventus’ (Independent) before the Chelsea boss returned the favour by called our gaffer one of the greatest managers in the world (Metro). We emerged as 2-1 winners thanks to first-half goals from Dejan Lovren and Jordan Henderson. Diego Costa pulled one back from them after the break. Were you at the game? Did you see the incident? Get in touch!